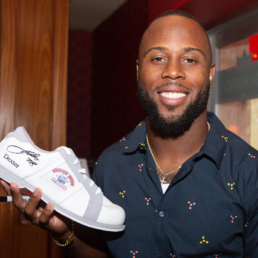 Star Patriots running back and client, James White hosted the 9th annual Sweet Feet for Strikes celebrity bowling tournament on Monday, September 9, 2018 at Kings Dining & Entertainment in Dedham, MA. The annual event is the largest athlete-attended charitable function in the New England region. Proceeds from the event are going to benefit Boston Medical Center; the star-studded bowling event has generated more than $2.3 million for the city hospital.